Asia is driving the massive growth in online shopping, with youngsters in particular leading the charge. But why are they so keen and what are they spending their money on? In Admiralty Primary School, in Singapore’s Woodlands neighbourhood, a group of students has just joined the e-commerce world. 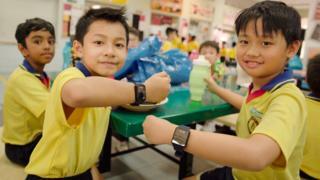 “Now I don’t need to think about losing my wallet,” says Bosco Wong, a 10-year-old student, sporting a new wristband for making digital purchases while at school. The wearable band, called “Smart Buddy”, is sponsored by the Post Office of Singapore Bank, and everyone at Admiralty has just received one. It is all part of Singapore’s drive to go cashless, and the country’s Education Minister Ong Ye Kung was at his school to launch them. Parents can track and manage their children’s purchases online. Asia – its younger generations, in particular – has embraced online shopping and digital payments with remarkable enthusiasm. And given the UN’s estimate that there are 720 million people aged 15-24 living there – dwarfing North America’s 47 million and Europe’s 82 million – it’s no wonder Asia is driving the e-commerce explosion. China, which overtook the US in 2015 as the country with highest e-commerce spending, now accounts for 40% of the world’s online commerce. Retail giant Alibaba, founded by billionaire Jack Ma, recently reported a 61% rise in quarterly revenues to 55.1bn yuan ($8.3bn; £6.4bn), thanks largely to the popularity of its online shopping platforms, Tmall and Taobao. Monthly active users of its Chinese retail marketplaces grew to 549 million in September, up 20 million from three months ago – that’s an astonishing rate of growth. By 2020, 60% of all those aged 18-29 will live in Asia and will have a disposable income of $6tn (£4.6tn), says consultancy firm Accenture – that’s higher than any preceding generation. But why are Asia’s youngsters so keen on buying online and what do they spend their money on? Well, this has clearly been a technology-driven phenomenon, with the smartphone as the key innovation changing consumer behaviour. About two-fifths of younger people in Asia have bought something online via their mobile, says Accenture. “I do buy quite a lot of books online,” says Theophi Kwek, 22, who recently finished university at Oxford and is now doing national service in Singapore’s army. Books from overseas are cheaper than they are in Singapore, he says. He often uses UK sites and says shipping “usually takes a couple of weeks at most”. But Yi Ying Ng, the 27-year-old founder of AllSome, a parcel tracking service, is part of a rising trend to connect other Asian markets to China’s engine. The volume of packages from China to Malaysia has gone up from about one million a year in 2012, to about 73 million now, says Ms Ng. She takes goods from the southern Chinese city of Shenzhen, and delivers them to online buyers in Singapore and Malaysia, where she is originally from. She will be expanding next year to Indonesia, then Thailand, she says. When she started her company five years ago, posting a parcel from China cost $15-25 and took 30-50 days. She has found ways to lower this to $5, and shorten the delivery time to three days, she says. But her real innovation is helping small merchants to sell to friends and family through Facebook, Instagram and Snapchat, she says. “We’re trying to help everyone become a merchant, a decentralised approach,” she says. Research from TMI Strategy suggests that worldwide, 62% of e-commerce users under 30 take their cues in purchases from influential users online, whether friends on social media or specialist bloggers. Ms Ng calls her approach “social commerce”. Most of her merchants are between 24-28, she says, and most of their customers are in their early twenties. But while China increasingly sells online to the rest of Asia, younger people in its rising urban middle classes are buying goods and services online from further afield. Qiaoyun Zhang and Xiaochen Xu are parents in their thirties, and live in Beijing’s prosperous business and embassy district, Chaoyang. Recently they started using a platform called VIPKid to buy live English lessons from teachers in North America, for their four-year-old daughter, Lu-Ke. The lessons last 25 minutes and their daughter takes four of them a week on an iPad. “North American teachers, they are very patient compared with Chinese teachers,” Ms Zhang says. Companies wanting to sell to these younger Asian audiences like Mrs Zhang should realise brand loyalty doesn’t any more exist, says Michael Talbot, co-founder of 3radical, a brand engagement firm working in East Asia. His firm provided the technology behind Singapore’s Smart Buddy. “These young people, they’re not disloyal, they’re just using tools in a very competitive landscape. It’s fundamentally different from having one high street with a Chinese, an Indian, and a couple of pubs,” he says. Loyalty schemes accordingly tend not to work in China, Vietnam and Thailand, but games tied into a brand and incorporating an element of luck have cultural appeal there, says Mr Talbot. So how will the likes of 10-year-old Bosco Wong be shopping in future? Using his voice to authenticate a purchase perhaps? Tapping the side of his augmented reality glasses? Whatever the technological innovations, these Asian Tiger cubs are likely to be in the vanguard as e-commerce continues to sweep across the world.